Q: According to the report of Sputnik news agency, Russian Ambassador to China Andrey Denisov said in an interview that the Shanghai Cooperation Organization (SCO) Summit will be held in Qingdao on June 9. The Russian President is expected to attend the summit. According to the tradition of exchanging visits between the Chinese and Russian leaders, the new Russian President is likely to visit China. Can you confirm this? A: As the rotating president of the SCO, China will hold the SCO Summit in Qingdao in June this year. Presently, the Chinese side is in close communication and coordination with other member states on the preparations for the summit. China will work with all relevant parties to ensure the full success of the summit, thus injecting new impetus into the sustained development of the SCO. Russia is an important member state of the SCO and we welcome the attendance of the new Russian President at the summit then. With regard to the Russian President's visit to China, it is a tradition for the heads of state of China and Russia to exchange visits annually. In addition, they maintain close communication through bilateral meetings or on the sidelines of multilateral occasions, letters and telephone conversations. This fully demonstrates the uniqueness of China-Russia relations which are developing at a high level. We believe that this year the two heads of state will continue to maintain close exchanges and lead the high-level development of the China-Russia Comprehensive Strategic Partnership of Coordination. Q: According to reports, the Director of US National Intelligence Daniel Coats said at a hearing of the Senate Intelligence Committee that the US is confronted with multiple threats posed by countries like Russia and China, including the Iranian nuclear issue, the Korean Peninsula nuclear issue, cyber threat, espionage, and weaponization of outer space. Do you have any comment on this? A: We have noted the relevant report. The United States is the No.1 major power in the world with unparallel military might. If the United States felt that it was threatened hither and thither, what would other countries do? Shouldn't they feel that the danger just lurked at the doorstep? How could they even survive in that case? I don't know why the United States has such a strong sense of insecurity. I want to stress that there is no such thing as the absolute security under the sun. Moreover, one country's security cannot be achieved at the expense of other countries' security. The Chinese side always advocates a new security concept featuring common, comprehensive, cooperative and sustainable security. 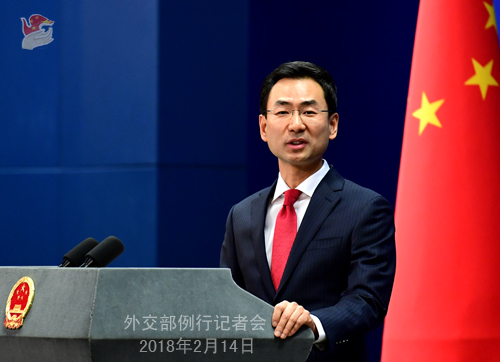 We hope that the United States can discard the "zero-sum game" mindset, refrain from viewing the relations between major countries from a confrontational perspective, correspond with the trend of the times, namely, peace and development, and make concerted efforts with China, Russia and other members of the international community to jointly uphold world peace and security. Q: You just now said that the SCO Summit will take place in June. Is June 9 the confirmed date? Has Indian Prime Minister Narendra Modi confirmed his attendance? A: We certainly welcome the attendance of the heads of state or government of the SCO members at the summit. Now the Chinese side and other member states are in close communication on the preparations for the summit. We hope that all relevant parties can make concerted efforts to ensure the full success of the summit and inject new vitality into the development of the SCO. Follow-up: So June 9 is the confirmed date, isn't it? A: I said just now that the Chinese side will hold the SCO Summit in June this year. Q: How many Chinese tourists have had to cancel their trips to the Maldives? Reuters has tried to contact the State Administration of Tourism, but we haven't been able to get response. Can the Foreign Ministry offer us more details on this? A: The Foreign Ministry and the Chinese Embassy in the Maldives have issued the travel alert in response to the situation in the Maldives. According to the information I have received, the relevant authorities of China are guiding the Chinese citizens to pay close attention to travel safety risks and properly arrange their schedules. Regarding the specifics mentioned by you, including the specific figures, I am not aware of them. Q: According to reports, the Philippines said that it has objected to China trying to name a maritime feature at Benham Rise, which is part of the Philippine's continental shelf. Could you comment on that and why China would try to name something that isn't part of its territory? A: I am not aware of the specific situation mentioned by you. According to the information I have received, the Sub-Committee On Undersea Feature Names is a specialized international organization in charge of establishing standards on naming undersea geographic features. According to the deliberation rules of this organization, the relevant countries and individuals may submit naming proposals on the unnamed undersea features which are twelve nautical miles away from the littoral states. The Chinese side is always engaged in the relevant work in accordance with the international practices and the rules of this organization. 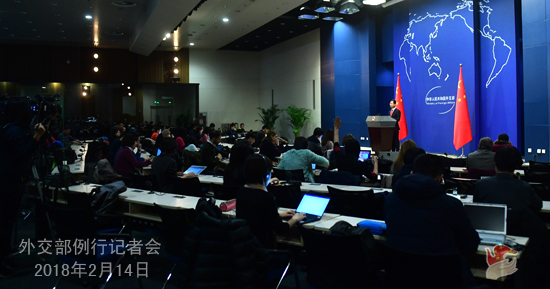 China respects the relevant rights enjoyed by the Philippines concerning the Benham Rise. Meanwhile, we also hope that the relevant parties can view relevant technological work with a professional and responsible attitude. Q: According to reports, US President Donald Trump complained yesterday about Chinese and the ROK subsidies for steel and aluminum exports and said that the US is considering new trade sanctions against China and the ROK, including tariffs. What is your comment on this? A: Presently, the world economy is showing the positive momentum of recovery. All parties should cherish this even more, jointly strive for an open world economy, send out the positive signal of win-win cooperation and help to stabilize global market expectations. Against this background, any unilateral or protectionist action would harm the relevant countries and enterprises at the upstream and downstream of the value chain, exacerbate the global trade environment and exert negative impact on the momentum of world economic recovery. All parties should make all-out efforts to avoid that. Here I would like to stress once again that the China-US economic and trade relations are mutually beneficial in nature. The United States is the largest economy and China is the second largest one in the world. Given the large size of their economies, big bilateral trade volume and profound integration of their interests, it is inevitable for China and the United States to have some differences and even frictions in the economic and trade area. What is important is that we should view these differences and frictions from a rational and objective perspective and follow the spirit of mutual respect, equality and mutual benefit to address and manage them through dialogue and consultation. China always views the United States as an important trade partner. We are willing to properly handle the issues arising from the bilateral trade through opening domestic market to each other and making the pie of cooperation bigger so as to deliver more benefits to the two peoples. Tomorrow is the Lunar New Year's Eve and the day after tomorrow is the Spring Festival. 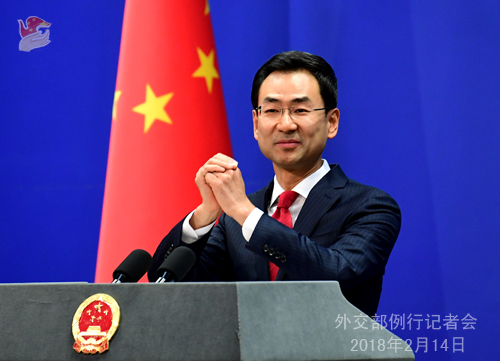 On behalf of the Information Department of the Foreign Ministry and my colleagues Lu Kang and Hua Chunying, I would like to avail myself of this opportunity to extend heartfelt thanks to all the journalists for your support and cooperation to our work during the past year. We look forward to another year of close and pleasant cooperation with you. I wish all of you good health, success in your work, a happy family and prosperity in the Year of the Dog. I wish you all a happy Spring Festival.